Yes, I know most eco gifts don’t need batteries but some tech gadgets and other goodies do, like digital cameras and who is going to be without a camera on Christmas? This year you have a green choice when it comes to batteries-other than the often expensive and hard to find recharge-ables (why can’t they just put them with the rest of the darn batteries, but no you have to go searching and end up in the electronics section if they carry them at all). 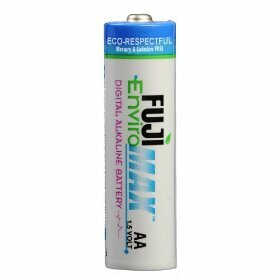 Anyway this year you have the option of buying Fuji’s new EnviroMAX batteries. Fuji’s new EnviroMAX batteries are made specifically for high drain electronics devices-like digital cameras. They are manufactured using sustainable and eco-friendly standards and are even packaged in recycled paper. One of the best things about the new EnviroMAX batteries is what they don’t have- they are mercury, cadmium and PVC free which makes them landfill safe (but you should still take batteries in to be recycled). This holiday season there’s no reason to forget the batteries. I know I’ll be getting these batteries. I really need a battery that my digital camera won’t drain in 10 photos. I swear that’s how fast my camera drains batteries-even the rechargeable ones- especially the rechargeable ones. I am going to give the EnviroMAX batteries a shot and see how well they really hold up. Hmm.. Almost all products are packaged in recyclable or recycled paper and PE(T) plastics these days, at least here in Europe.. It’s also the easiest way to say ‘we’re green’..
Have you founf out what exactly is IN these batteries? Just saying ‘we’re green’ doesn’t really convince me..
It’s great that they are mercury, cadmium and PVC free – it would still be great to know what IS in them, and also ‘landfill-safe’ is terribly misleading as it prompts people to throw away and not recycle!! In what ways are they better than LiIon or NiMH (rechargeable) batteries? Also, NiMH and LiIon batteries need to be treated diffferently! Cameras may also be more or less energy efficient.. This is a great idea and everyone you add these to their eco shopping list. This will make you a more eco shopper as batteries is something we have to buy!